The day started out crisp and clear with just a hint of a breeze dancing over the hills and valleys of Wolwedans Game Farm. A cuppa coffee and muffins welcomed everyone for their first taste of our magnificent Country House with un-interrupted views of the mountains and the Indian Ocean in the distance. One and all was excited and juggled for a spot on the bakkies for their first ever Educational Feeding Game Drive. 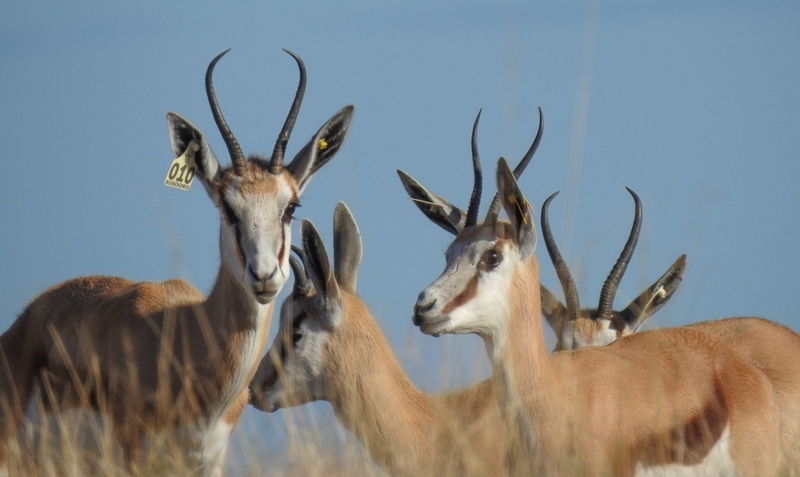 First up was the Kalahari Springbucks and what a sight it is to see them prance around. Following we encountered the Sables with Martin (our guide and owner of Wolwedans) being a fountain of knowledge on the ins-and-outs of breeding. He also elaborated on the history of our breeding program and entertained everyone with anecdotes. Next up was the rare Coffee Springbuck with their amazing dark colour who, to everyone’s delight, put up a beautiful show of ducking, diving, and jumping. Maybe our Boks can learn a thing or two here…..
Onwards and upwards to see a 2 weeks old Sable baby and our inquisitive Giraffe’s. For a while there our visitors thought they were statues until they decided to get up and get a closer look at what the fuss was about. Last but not least, we also saw three different varieties of Impala; the Normal-, Saddleback- and Black Impala. We finished off just in time to not get rain soaked but what an interesting day to experience and the most amazing of all is the close-up photo opportunities you get of our buck. Thank you to our visitors and we hope to see you again soon.